Row 1: * Purl 4, knit 5, purl 5, knit 2, purl 5, knit 5, purl 4; repeat from * to end. Row 2: * Knit 3, purl 5, knit 5, purl 4, knit 5, purl 5, knit 3; repeat from * to end. Row 3: * Purl 2, knit 5, purl 5, knit 6, purl 5, knit 5, purl 2; repeat from * to end. 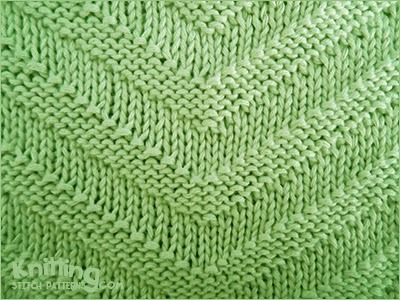 Row 4: * Knit 1, purl 5, knit 5, purl 8, knit 5, purl 5, knit 1; repeat from * to end. Row 5: * Knit 5, purl 5, knit 10, purl 5, knit 5; repeat from * to end.